El Colegio de México AC – ColMex is a social science and humanities research and teaching university in Ciudad de México. To keep pace with evolving methods of instruction and technology, ColMex upgraded technologies across campus. The project included the Digital Education Program – PRED, an AV and multimedia development unit whose function is to provide digital and interactive productions, such as academic interviews, videos, short courses, and full MOOCs. A goal of the project was to upgrade the AV system within the divisible Alfonso Reyes Auditorium with a fully automated digital installation. It needed to be easy to update in the future to support the 4K video resolutions provided by their new broadcast servers. Also, the new twisted pair cable infrastructure was to remain in place as the AV sources and display devices were replaced over time. To achieve this versatility, Asesores y Consultores en Tecnologia SA de CV – ACT installed Extron XTP Systems®, ShareLinkTM 250 Series Wireless Collaboration Gateways, SMP 111 H.264 streaming media processors, and a Pro Series control system for centralized AV control. Each side of the divisible auditorium provides three display devices: an HD projection system, a 48" flat panel display, and a confidence monitor. The two pre-event lobbies and the shared control room include 55", 48", and 32" displays, along with multiple monitors. System requirements included AV connectivity for digital devices and support of HDMI, 3G‑SDI, and wireless transmissions. Content from HDMI sources would be converted to 3G‑SDI for ingestion by two NewTek® TriCaster® TC1 production systems, which output video resolutions up to 4K. Two, independent videoconferencing systems plus a 12‑microphone audio system would be part of the installation as well. To support PRED, ColMex wanted the ability to stream and record sessions simultaneously, and the switching system had to be easy to control in all room configurations. Exceptionally reliable and fast switching among the various source signals was mandatory. The best solution was a comprehensive integrated AV system. Working together, ACT and the university chose the Extron XTP II CrossPoint 3200 32x32 digital matrix switcher. Its built‑in technologies and modular design enabled configurable support of various source signal formats. If future upgrades were required, switching cards and displays would be swapped out, while the XTP II frame stays in place. ColMex was also impressed that the XTP II platform is capable of supporting the data rate requirements for 8K video formats. 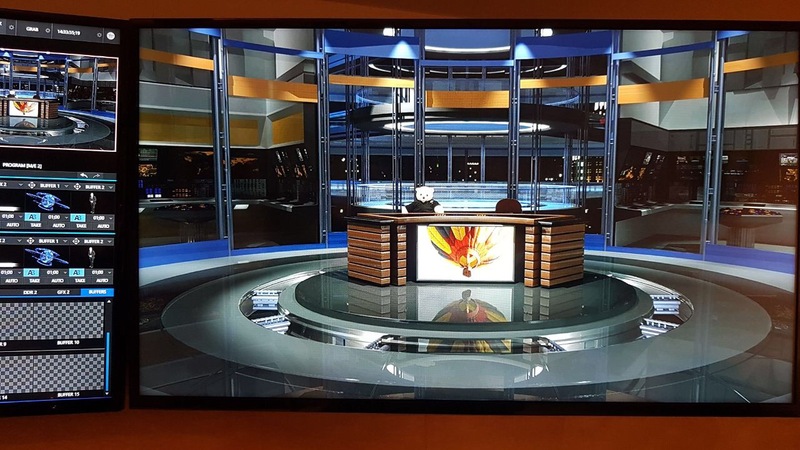 The frame is configured as 24x24 with a mix of HDMI, 3G‑SDI, and XTP CP twisted pair input and output boards for local and remote signal distribution. “The modular design and hot-swappable features of the XTP II CrossPoint matrix switcher make it easy to support, and the 50 Gbps backplane will let us keep the core of the system in place when we upgrade sources and displays in the future,” says Centeno. An Extron XTP CP 4i 3G‑SDI input board supports both TriCaster systems. XTP CP twisted pair input and output boards support connected devices and feed content to the Christie® D13WU HS DLP projectors and the other display devices. Extron XTP II CP 4o HD 4K PLUS output boards provide video and audio signals to the production and streaming systems, and the XTP II CP 4i HD 4K PLUS input and output boards enable connection of the two video conferencing systems as well as future HDMI sources that output 4K/60 at 4:4:4 chroma sampling. To feed the TriCaster production systems, two Extron DSC HD‑3G A scalers convert HDMI to 3G‑SDI. HDMI signals are also sent to the two Extron SMP 111 Streaming Media Processors to fulfill PRED's requirements to stream/record content and videoconferencing feeds simultaneously. To support wireless connectivity, an Extron ShareLink 200 N gateway is assigned to each room. With the XTP II CrossPoint matrix switcher's 50 Gbps digital backplane and included technologies such as SpeedSwitch®, the installation provides the required system functionality and expandability. The capabilities to switch mixed formats and transmit signals long distances over the twisted pair cable infrastructure, as well as support 4K video resolutions and higher, gave an optimized approach for ColMex. Fourteen XTP T HWP 101 4K decorator-style wallplate transmitters enable HDMI signal extension over XTP® to the matrix switcher from the PTZ cameras and computers on the stage and at the back and sides of each divisible space. The wallplates also support connection of auxiliary source equipment. Extron CPM101 one gang mounting frames with MAAP modules offer microphone connectivity. An Extron XTP SR HD 4K receiver mounted on each projector lift scales content to the projector’s 1920x1200 native resolution, and its integrated relays simplify control of the projection screen. To support the confidence monitors and the various displays in the lobbies, an Extron XTP R HD 4K receiver is installed with each. The XTP II CrossPoint matrix provides remote power for transmitters and receivers over the shielded twisted pair cable. Also, RS‑232 insertion from the matrix switcher's Ethernet control port enables remote management of the videoconferencing systems. ACT replaced the existing cable infrastructure with Extron XTP DTP 24 and STP20 cabling to ensure signal quality and performance over the long distances between the control room and remote endpoints. For local AV connectivity, the design utilizes HDMI Ultra and HDMI Pro cable assemblies. With the Extron Pro Series control system, all AV sources and display devices are monitored and controlled from the central control room, as well as from a remote location. An Extron TLP Pro 1022T 10" Tabletop TouchLink Pro Touchpanel assigned to each side of the divisible space share an IPCP Pro 550 IP Link® Pro Control Processor mounted in the rack with the matrix switcher. The touchpanels and control processor communicate via Ethernet. Secondary points of control are two Apple® iPad® tablets and the wireless system. Two of the control processor’s eight RS‑232 ports enable management of the projectors and its eight relays enable a technician in the control room to operate the projector lifts. This, combined with screen control via the XTP scaling receiver's relays, significantly streamlines room setup. The remaining RS‑232 and bidirectional control ports, four Flex I/O connectors, and the port for connecting an eBUS® button panel are reserved for future system expansion. The IPCP Pro 550 control processor includes Extron LinkLicense®, which is a quick, cost-effective way to add more powerful capabilities to Extron control products. Two of the benefits to ColMex include simplified deployment of BYOD gear and seamless operation with the Extron Control app that was downloaded to the support staff’s iPad tablets. Rather than incurring a cost to license each member of the support team, LinkLicense for User Interfaces allows all authorized users to monitor and operate the auditorium installation from remote locations. Global Scripter, Extron's feature-rich IDE – Integrated Development Environment, was used to program a flexible control system that can easily recall and enable different system operation modes, depending on room configuration. The control system is programmed to monitor a sensor on the divisible wall. When the wall is open, the room is in the combined mode and source signals can be routed to one or more displays. Each side has independent control of its designated sources and display devices when the wall is closed. This functionality impacts the use of the audio system and each videoconferencing codec. The audio DSP is set to recall presets established for each operational mode and provides control of audio levels as needed. A VoIP mode is controlled through the Extron control system as well. This Python-based programming also enables control of two digital recorders, one assigned to each side of the space. The project had a tight deadline to remove the previous system, replace the conduit, run the cabling, then install, configure, and program the new equipment. This period included commissioning the system and training ColMex's support team on system usage and troubleshooting. Two situations impacted system integration. Partway through installation, the auditorium was needed for a conference that had been booked prior to the system upgrade. ACT was able to give temporary AV system capabilities, allowing the event to be held as scheduled. The second obstacle was when the region was hit by a major earthquake during installation. After comprehensive testing, ACT confirmed that the new AV system and cable infrastructure had withstood the 20 seconds of violent shaking with no discernable damage. It only required reseating a few connectors and correcting some network issues. Even with these occurrences, the many capabilities of XTP and the user-friendly Pro Series control system allowed the entire project to be finished within 13 weeks. The Alfonso Reyes Auditorium can serve as a broadcast studio to suit PRED production needs.